As you may have guessed by now, I love working in an optimized environment, designed for getting the crud out of the way so that I can focus on development. Just like a carpenter needs to not be thinking about the hammer, or the painter about the mechanics of the canvas, my computer and its operating system need to fade into the background, almost as if they were not really there at all. Have you ever, in the course of working with a database, needed to do a long import, export or other time-intensive task? For example, I have worked on a very large solution recently that required 4 hours to import the DDR into BaseElements. Not wanting to lose an entire 1/2 day to the task, I needed a solution where I could both perform the import and continue working on other projects. The best solution to this conundrum is to simply have more tools available. In this case, since I have two legal licenses of FileMaker 11 available to me, I have installed the application twice on my development machine. Rename the current installed version folder of FileMaker Advanced (or FileMaker). I used FMA11-A. 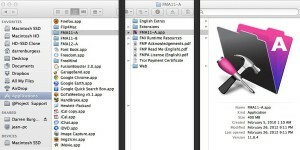 Rename the installed FileMaker Pro Advanced application. Again I used FMA11-A.app. Install FileMaker/FileMaker Advanced again, using the second license key. That’s it! Now both versions can be run simultaneously. Note that when performing an update of the FileMaker software, the updater will ask you which installation you want to update. Select an installation, complete the first update, then run the updater again and it will update the other installation. I can run that ginormous DDR import on one instance and be happily developing a solution on the other. It also means you can have two Manage Database windows, two data viewers or two script debuggers open at the same time. Or even two separate logins (Admin and User for example) into the same solution. Well, the icons are more than just for fun, as they provide a visual cue in the OSX dock and application switcher. I hope you enjoyed this quick tip for setting up a more efficient FileMaker development environment. I’d love to hear about your super-secret tips and tricks in the comments. As a FileMaker developer with a focus on delivery of high-value solutions as quickly as possible, I always look for ways to enhance my development environment to optimize speed and efficiency. As you can imagine, there are multiple tools that I need immediate and reliable access to throughout my development day. …and any number of other applications as needs dictate. Managing workflow with this many applications active requires a consistent environment. I need to be know where things are and be able to access them with as little friction as possible. This is where a multiple monitor setup helps increase efficiency and allows me to focus my attention while simultaneously monitoring communication tools so that I can respond to immediate needs. In order to connect the LCD monitors, I use two Diamond BVU Display Adapters. These devices allow you to connect additional monitors to a system via USB. It requires one adapter for each additional monitor plus a software driver. The Windows driver is in the box, and Mac Drivers are available for download. They work well, although occasionally there can be screen flicker, graphic artifacts, or blackouts, and video performance is a bit laggy on the USB connected monitors. You will most definitely need a powered USB Hub in order to get all the USB cables hooked up. With a multiple monitor setup, I can now position all of my application windows in a manner that allows quick access to resources. As a Mac user I make use of Spaces to organize my application windows. For example, FileMaker and all of its required windows gets its own space spread out across all four monitors. iChat is present in every space on a secondary LCD. While I do move windows around, I try to maintain a set place for different windows so I know where they are. And, if my windows become disordered, I use the free application Display Maid to restore window positions and sizes in every space with a single keystroke. My goal is to reduce and remove all friction in the environment so that I can focus on delivering high-value applications to our customers in the fastest manner possible. The recent post from my fellow MightyData developer, Darren Burgess, caused me to reflect on my own developer reference tool. This is a tool I built using FileMaker, since there were times I needed the function reference offline, or without a floating help window. I built this tool a few years ago starting just with calculation functions, then adding more reference sections to keep everything in one place. The tool went through some minor revisions the past few years. 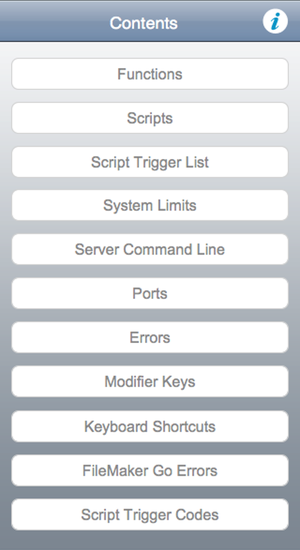 I added all script steps, a list of script triggers, a layout where the script triggers are spoken so I can get a sense of the flow or order in which they are fired, a list of all FileMaker errors, the fmsadmin commands, all the various system limits, ports for server, modifier keys, script trigger code numbers, and some keyboard shortcuts. As I came across something in FileMaker that I used and could be organized, I added it to my reference. As developers we tend to build our own code libraries and reference tools. In the past, I’ve stored my various libraries and notes in different places, from text documents to web pages, to MySQL databases and ftp folders. When I built my FileMaker reference it started small: I wanted to keep track of a few commonly used functions and examples so I could quickly re-use them. Once I started to add in the native functions, I found I couldn’t stop, and soon I had all the functions. Since these are available in the FileMaker help file, one might ask, “Why bother?” I preferred a simpler interface, and one I could manage myself. 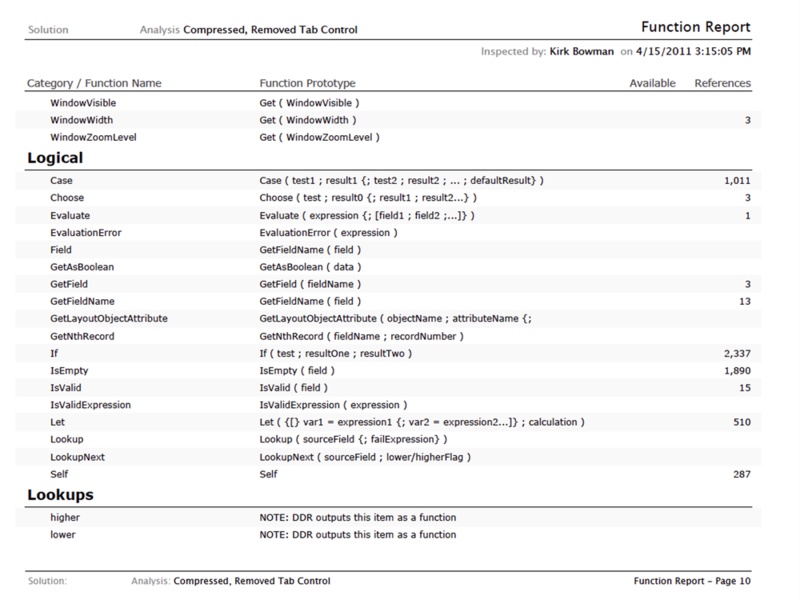 This tool is comprised of individual tables for the sections, such as functions and scripts. Rather than store everything in one table, and make adjustments as I add types, I decided to keep all my types or categories separate. There is a simple dashboard interface that lets me jump to the various areas to quickly look up information. Developing this tool in FileMaker lets me experiment with several things, but as it’s a spare time effort, it remains continually under construction. Some of the information is basic – port numbers or error codes. Script steps are organized by type, with a goal of some day showing all the parameters so there no longer is a need to create a new script just to see these parameters. Rather than bringing up the Terminal and looking through the help, I can see all my notes at once. Calculations often require trial and error. I set up the functions reference area so that I could test most functions without opening the Data Viewer, by evaluating the Code field (see below). This simplified method lets me quickly test some basic functions, and add notes as I come across certain behaviors or short-cuts. Though crude and limited compared to the Data Viewer, I’m able to extend this where the Data Viewer doesn’t work, such as FileMaker Go. While not yet fully Go compatible, I ported over a version to FileMaker Go the moment this became available, giving me a reference-on-the-go. The smaller interface requires adjusting some features. The dashboard becomes more to the point. The space for notes no longer available, I considered using Show Custom Dialog. This does show more text while on the same record, but doesn’t allow editing. Still, having a quick reference in my pocket can be useful. Although I’ve not added any FileMaker SQL references like Darren did with his Notational Velocity example, that seems like the next logical step. The key for any reference is to be comprehensive and useful, and as such my small tool cries out for a SQL section with examples. 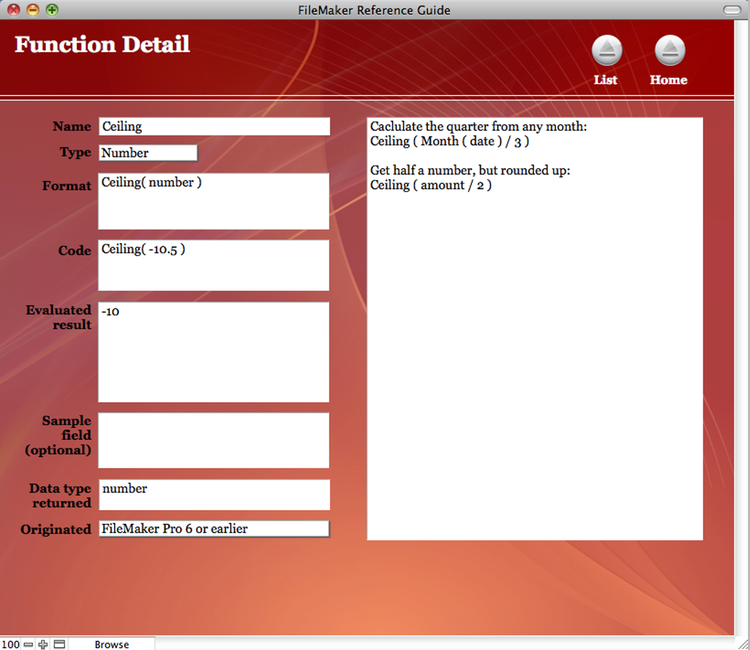 As with every tool, there are pros and cons to building this reference tool in FileMaker. If I’m in the middle of something in another FileMaker solution, I cannot always get out of a modal window to check my reference. On the other side, I can experiment with design and interface using FileMaker, and as it’s my personal tool I can leave the mess unattended or shove it under a rug for another time. 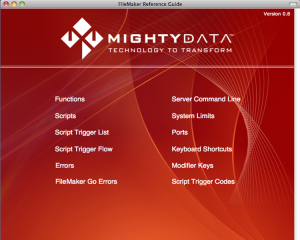 I think quite a few FileMaker developers have built their own reference tools. We have books, use the Internet for searches, but oftentimes we want to turn to something we use daily and assimilate the external knowledge into the familiar. As a developer looking to deliver projects to my customers with the highest value, I am constantly looking for ways to increase my development speed. To that end I have created a developers’ reference library using a handy (and free) little application called Notational Velocity. NV is an OS X application that allows for rapid creation and search of notes. While I have not tested such, apparently ResophNotes is an equivalent Windows application. Both applications sync with SimpleNote, so you can get your notes on the web and on an iOS device. 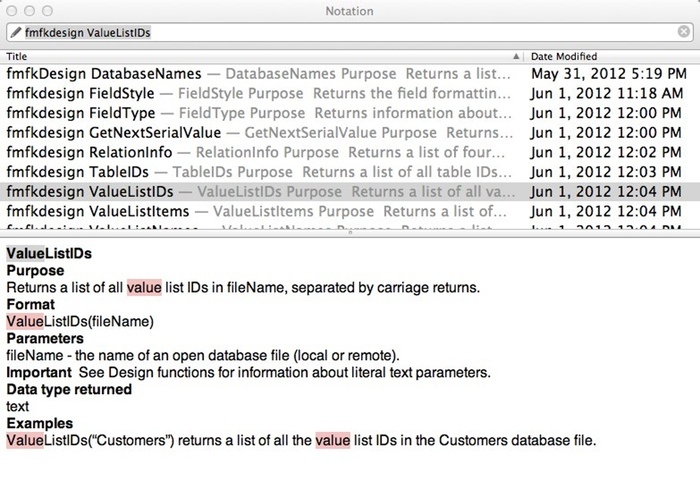 NV uses a search-while-you-type field to allow you to search your database of notes. If the application does not find a match, you can simply hit enter and it creates a new note with the title you typed in the search field. Notes are stored as text files in a directory of your choosing and the app provides the necessary keyboard shortcuts for the power user. Hint: NV stores notes in a database in the application support folder on OSX. In preferences, you can change the location and choose to store the notes as plain text files. You can download the current version of the library below. If you have a suggestion to add to the library, please post a comment below. FileMaker Pro 12 brings a new storage method for container fields. This session from the 12 Days of FileMaker 12 introduces developers to the new storage method from a practical usage point of view as well as from a technical point of view. Tim Neudecker is a leading software engineer who has over 20 years’ experience as a professional FileMaker developer. He spent over ten years as an in-house developer for companies such as Macy’s/Bloomingdales and AGA. In 2003, he joined KyoLogic as co-founder and CTO. Tim has presented four times to the FileMaker Developer Conference on topics including security, system performance and developer tools. 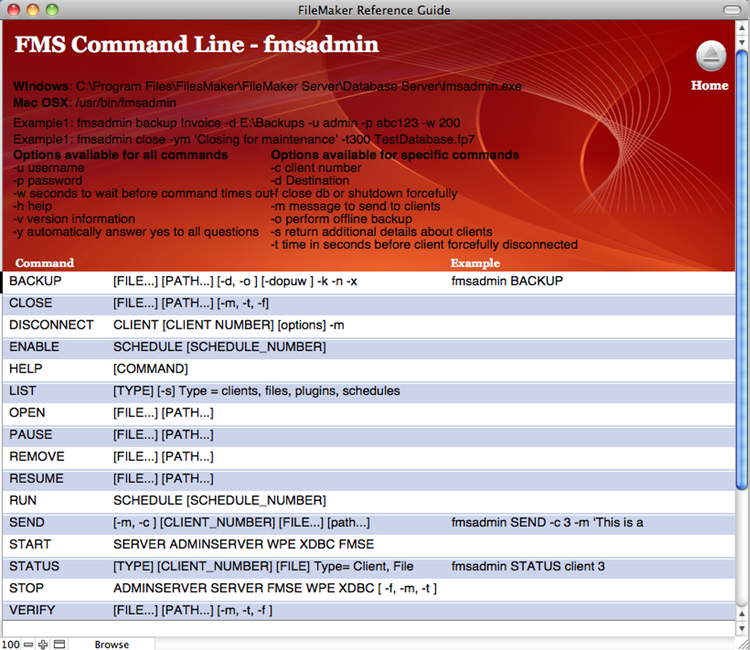 He has published articles in FileMaker Advisor on system integration and performance tuning. In 2003, he was honored with a FileMaker Excellence Award for his contributions to the developer community. Fields. Layouts. Calculations. Relationships. 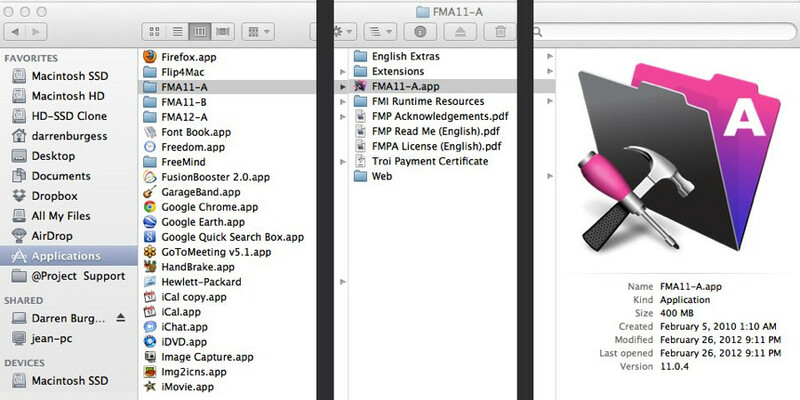 All of these are invaluable pieces of FileMaker and we, as developers, implement our own flare, excitement, and style to each of them. And as a lover of the Liberal Arts I believe that we should always thrive to be excited about what we do and how we do it. But do you know what makes it a better experience? Consistency. I’ve learned this lesson the hard way. Flashback to the first database I ever built – I was so busy trying to understand and get things done that I forgot the magic of consistency. Flash forward to 3 years after I built that database – I now had a sticky mess in front of me. Every time I had to change a script or find a relationship, I struggled with what I called that field or how I named that script. Cut to now – While I still falter in consistency from time to time, I have learned the art of sticking to a style. Choose a strict naming convention and stick to it! This is probably the predominant place for variation. Are you going to use spaces? Are you going to use underscores? How do you name your primary keys? How do you name your foreign keys? So what do you notice about the field names above? All fields that should be “grouped” begin with the same prefix. Most people wouldn’t say “name first” but from an alphabetical perspective, it helps to keep first name and last name together. By being consistent, I could write a script that uses the Go To Layout step but instead of hard coding the layout name, I can use a calculation. Imagine that you are on the “Contact – Main” layout and you want to go to the list view. And you wanted a similar button for the “Project – Main” layout that took you to the corresponding list view. You could write two scripts, or write one flexible script! A calculation like that would work for either the Contact layouts or the Project layouts. Talk about flexible and easy! theList – Naming a variable “list” is not a good idea as there is a calculation that uses that word. Add a prefix to all “FileMaker words” – the, a, your initials, etc. I’m by no means preaching the need to use my naming convention. I’m just alluding to the fact that I’ve “memorized” these values, which means that I won’t be surprised when I open a script and see a $count variable, for example. The purpose becomes very obvious to me (or at least obvious enough with some context clues). The point to take home is not my methods, but the idea of having a method. The real problem comes when you open up a solution you started 6 months, 12 months, 24 months later and nothing “makes sense” because there’s no method to the madness. Before I go further, I need to point out two things. First, “Inspector” is also the name of the palette to change element properties in FileMaker Pro 11. This article is not about that. Second, to use Inspector (or BaseElements), you need to have FileMaker Pro Advanced (FMPA) to generate a Database Design Report (DDR). The XML version of the DDR is imported into Inspector to create an analysis of the database. Inspector Pro 3.0v2 was released in March, and as a long time user, I was excited to see what changed in this new version. Of course, Inspector provides standard features like list and details views, a search interface, and reports for the elements in your database. Rather than a comprehensive review, my purpose is to highlight 10 features that caught my attention. 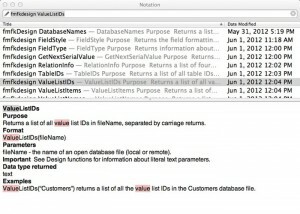 Native FileMaker Finds – Inspector uses a custom interface with Quick Find and portals to display elements in your database. Now they have added “Raw Data” views so you can search the elements using native FileMaker finds. Find Dormant Calculations – A dormant calculation is one that has been disabled by turning off a field option (like Auto-enter by calculation) or changing the field type from Calculation to something else. On the Calculations screen in Inspector, you can enter “Dormant” in the Quick Find to view all the dormant calculations. Apply Security Perspective – Inspector imports the settings for the Privilege Sets as part of the DDR. On the various screens, you can see what the effect of a specific privilege set is by selecting one from the Security Perspective drop-down. Display Changes Inline – If you have analyses of two versions of the same database, you can display the changes for a specific element “inline”. My only concern with this feature is it seems to require significant processing as it takes a few seconds to display (although it could be my computer). Script Step and Function Reports – These reports display an inventory of the script steps and calculation functions including how many times each is used. This is helpful to see, for example, how much the database uses If vs. Case. Index Percentage Report – This unique report shows the percentage of fields that can be indexed and the percentage of fields that are indexed by table. It also includes a bar chart for visual reference if you run Inspector using FileMaker (not the runtime). Script Trace Report – This report shows the entire code for a parent script, including subscripts with indentation, in one document. 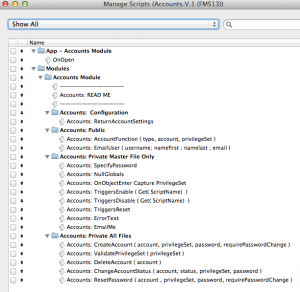 This saves having to jump in and out of multiple script windows in FileMaker. Open with FileMaker Go – If you host the database with FileMaker Server, you can open Inspector using FileMaker Go on the iPad. This is helpful if you need to review an analysis and you do not have enough screen real estate. Customize FileMaker Go Compatibility – As I write this article, FileMaker Inc. (FMI) has released FileMaker Go 1.2. Not only does Inspector show FileMaker Go compatibility when viewing scripts, it includes preferences so you can update the status of compatibility when FMI release a new version of FileMaker Go. Customize Detection and Comparison – Inspector also has preferences to customize how issues are included in a Detection Report and which elements are included in a Comparison Report. This is very useful if you only need to review certain elements types. Also, Beezwax has setup a Wiki for the documentation including tutorial videos for some of the key features. Both the help text and the videos are useful for learning how to get more out of Inspector. I continue to use Inspector each time I start to work with a customer who has an existing solution. Having this tool in my toolbox helps me get the best perspective on the database and ultimately, the customer. Imagine going to a new city, renting a car, and driving to a new location without a GPS or access to Google Maps. You would be lost without a landmark or even a general understanding of the neighborhood. This experience is similar for the FileMaker developer who takes over a solution from another developer. In the typical situation, you have to follow the trail of breadcrumbs from the original developer. These breadcrumbs, or development standards, organize the code so someone else can follow your work. The better the organization, the easier it is for the developer (yourself or someone else) to come back later and get oriented with the solution. 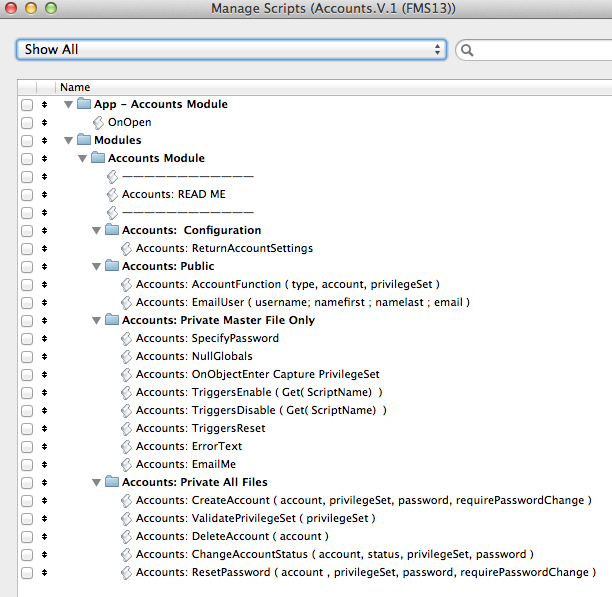 The code is simply the elements in the FileMaker database: tables, fields, relationships, layouts, scripts, etc. If you ask two FileMaker developers about their standards, you will get three opinions—one from each developer and a combination of the two. While there are strong opinions on the best way to do it, most developers agree the most important thing is to choose a set of standards and be consistent as you create your solution. To help you get started with your development standards, here are some free resources from the FileMaker community. FileMaker Naming Conventions and Standards – A good introduction to development standards for the intermediate FileMaker developer by DB Services, similar to those we use at MightyData. FileMaker Development Conventions – In November 2005, FileMaker Inc. published a PDF by a group of leading FileMaker developers. It is in-depth and thought-provoking, although it can overwhelm the novice developer. The Importance of Naming Conventions – CoreSolutions has been publishing development standards for over 10 years. They follow a modified version of the FileMaker Development Conventions by FMI. 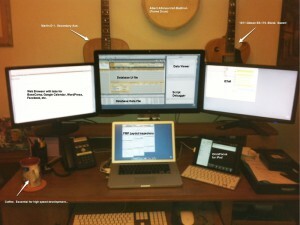 FileMakerStandards.org – This wiki is a grassroots movement started by Matt Petrowsky. On this site, Matt and his colleagues explain their development standards and why they chose them. 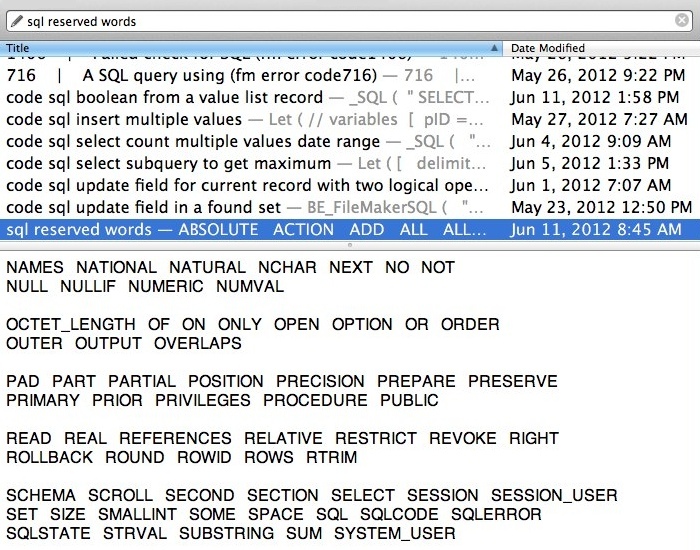 FileMaker Coding Conventions – A video by Matt for FileMaker Magazine introducing the standards that became FileMakerStandards.org. Anchor/Buoy Design Methodology – An outstanding presentation by Kevin Frank explaining the Anchor-Buoy method of organizing table occurrences (TOs) in the relationship graph. Six Fried Rice Methodology – Two articles from the blog of Six Fried Rice explaining some important development standards: separation model and anchor-buoy. Special Edition Using FileMaker 8 – Although the book was written for an earlier version of FileMaker, Chapter 27 is an excellent introduction to development standards including those used by the authors at Soliant Consulting.